Inspired by Todd “Don’t call me Scott” Scalzott and with thanks to this forum discussion, I decided to experiment with the DSM 5.2 Beta’s ability to leverage Cloud Sync with Google Nearline storage. This nudged me to update the DSM code on my ioSafe 1513+ (more details on that here) to DSM 5.2-5532U1 so that I could kick the tires with the fancy new magic in DSM 5.2. 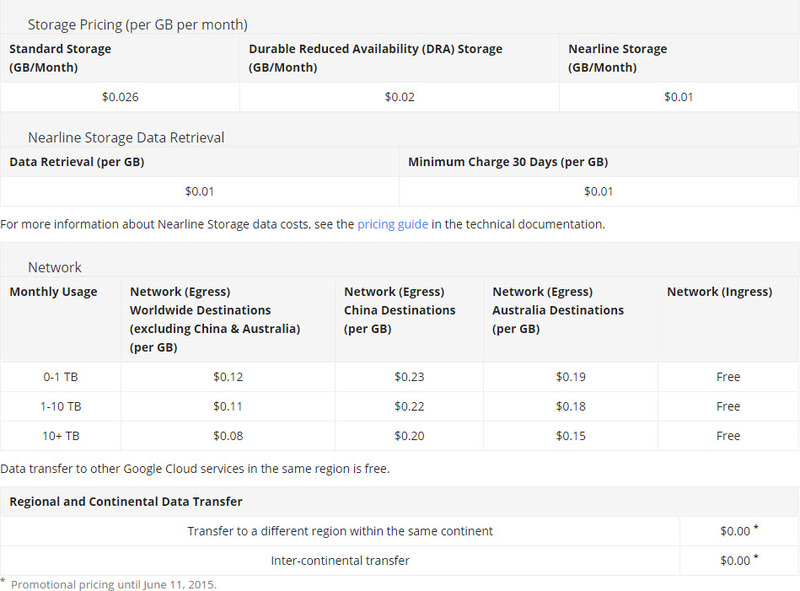 As for Nearline Storage itself, you’re paying the lowest cost per gigabyte, but also required to pay data retrieval fees. This is a similar model to Amazon Glacier (which I’ve written about previously) but Nearline is much “warmer” storage meaning you can get to your data fairly quickly. Glacier, on the other hand, takes a much longer time to hydrate. You can view all of the cost details on the pricing page, but I’ve captured the storage pricing below. Note: It’s ultimately up to you if this method of storage is cheaper than other alternatives such as Dropbox, and will largely depend on your access patterns. It’s also worth noting that Cloud Sync is not meant for backups per se, although you could use it to sync files in one direction as a means to achieve a poor man’s backup. As an example: I use Cloud Sync as a master node for Dropbox files in the home lab, rather than having to install a Dropbox client on all of my home desktops and servers, as a method of sharing files among my devices. If you’re looking to backup to cloud, I’d suggest Synology backup to Glacier as written about here and here. 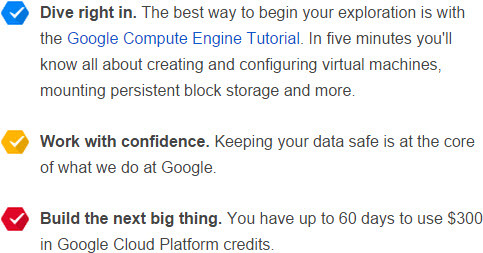 Google does a good job at describing how to build a bucket in their documentation. I’ll cover the broad strokes that I followed, but I’m going to assume that you can set up an account and create a new project. 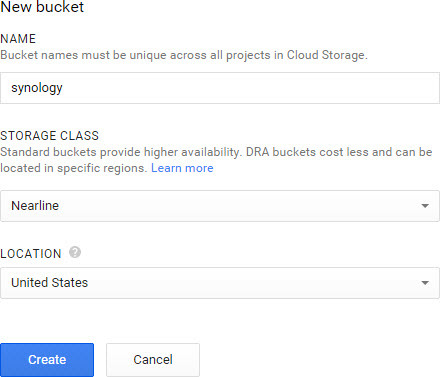 Once that’s done, select the Create a storage bucket task from the Project Dashboard. With the bucket created, scoot on over to the Storage access section, choose Interoperability, and enable interoperability access so that your Synology NAS can do its work. After interoperability is enabled, you can create access and secret keys to grant your Synology a way to authenticate to the bucket. Click the Create a new key button, then write down the access and secret keys for future use. These are somewhat analogous to a username and password, and the secret key is often forever masked after it is created – so make sure you keep it somewhere safe! 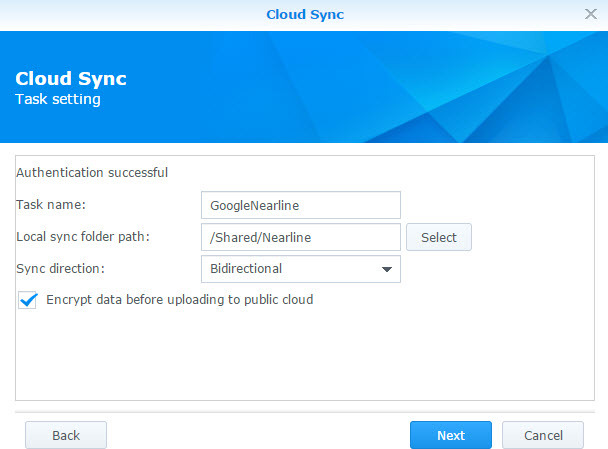 Everything else is just like a vanilla Cloud Sync setup job – fill in a name for the sync task, tell the task where to sync your files, and determine if you want the sync to be two ways (bidirectional), or just up into the cloud or down into your Synology array. I also set up encryption – which will require a name and password to decrypt the files – just for the sake of variety. Toss in files as you usually would, or upload them directly into the bucket on your Google project page. Nothing too fancy here – you’re storing stuff in the cloud. If you want to share the file, and didn’t enable encryption, you can select the Public Link box to provide a URL to your friends or co-workers. One thing that I found handy was the ability to delete the entire bucket with a click on the website. Normally, you can’t delete a bucket unless you’ve also deleted all of the objects within the bucket. Google does that for you. Snazzy. Public cloud diversity – set up sync tasks to multiple cloud providers for additional high availability and potentially less concern of lock-in. Tiered public storage – use Google Nearline as a higher tier of file storage for a certain set of data (such as files created in the last 30 days or accessed in the last 30 days), and then demote files down to Glacier beyond that time frame. Price models – it may be that your access patterns fit quite well with Nearline, keeping costs quite low, but you still want to retain the ability to snag a file quickly for one-off data pulls. 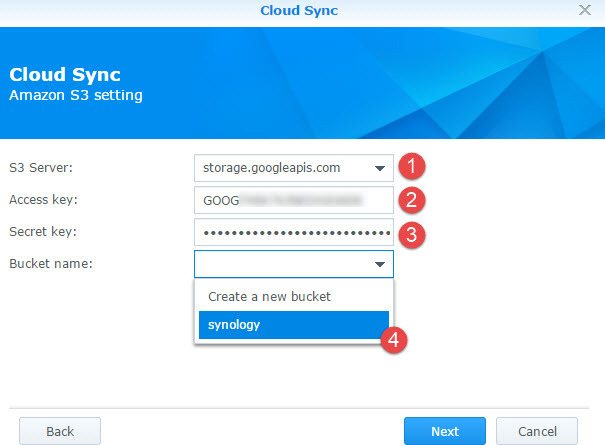 I use Cloud Sync on my Synology to backup data to my Google Drive. Works great. There is howver one limitation. Max file size is 10GB. This makes it dificult to sync backups of VMs as they are usually larger than 10GB. Is the file size limit lifted in the new DSM version? I’m not sure. My Dropbox usage is for small file sharing; I use Glacier for backups. It seems the 10 GB limitation was imposed by Dropbox for web facing apps. Cloud can be good for other things. But not for file sharing. Binfer on the other hand bypasses cloud storage servers making it very safe to send secure data. About cloudless sharing. Hmm – not sure if this is a vendor trying to hawk their wares or not, but I’ll bite. The premise of this post was certainly not to solve the file sharing use case. Additionally, the solution you suggest doesn’t seem to have an answer for data protection (my on-premises storage suffers a disaster and was the only copy) nor addresses the idea of data-at-rest encryption for cloud storage, which makes breaching the storage provider worthless since you own the private key. Another alternative would be Nasuni for cloud file sharing. After all, cloud storage is just servers in someone else’s data center – many of the same vulnerabilities presented for an on-premises solution are still relevant. Many thanks for the guide, used it with SynchBackPro as we’ve got too many files to synch. Failed to list buckets is what I’m experiencing. Now what? I’ve enabled the Google Cloud Storage api. Yes, I’m also getting ‘failed to list buckets’ . Checked and rechecked info, made new keys, no luck. Anybody have any advice? Still no connection, but I noticed that I’m not using DSM beta, but instead DSM 5.2-5565, maybe Synology fixed something. Anyone not using beta and can list the buckets? 1. Go to your console ( https://console.developers.google.com/ ) and create a project. 5. Now go to DSM 5.2 and install Cloud Sync if you havent already. 8. Enter key and secret. 9. You should now be able to choose your GCS bucket from the last drop-down. 10. The rest is the usual setup. Its annoying the key only works for one project. Thanks for this solution though. Wayne, I’ve been trying those steps too – step 9 still fails for me, with ‘Failed to List Buckets’ error. I made a whole new project in Nearline and generated new keys, same result. Did you type in “storage.googleapis.com” instead of selecting anything from the drop-down list? I know that I can encrypt data before sending it through to Google storage. However, this bogs down my DSM’s storage space and processing power. 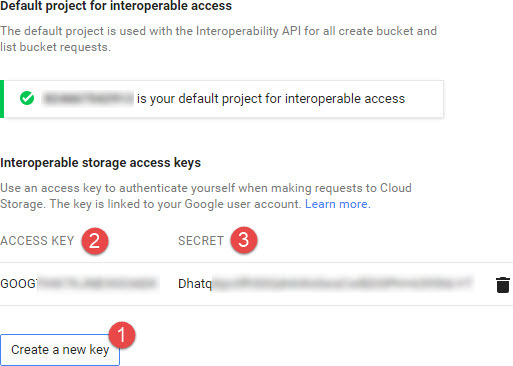 I would be sufficiently happy with the situation if the connection between DSM Cloud Sync and Google’s cloud storage was secured with https/tls. Do you know if this traffic is secured or not? It is particularly difficult to find this information on DSM’s documentation. The lack of a choice leads me to think it ought to be encrypted whenever possible, but that is certainly not a guarantee. Does anyone know if there is an elegant way of using this method with existing data in the cloud? I tried it and it appears to be re-syncing the lot. Great article! How do I retrieve/restore the data from Google Nearline? At one point I had the “failed to list buckets” problem but now (after update to the Cloud Sync app) I’ve got it working for one syncing folder. Note that I didn’t need to enable “interoperability” and get a key. 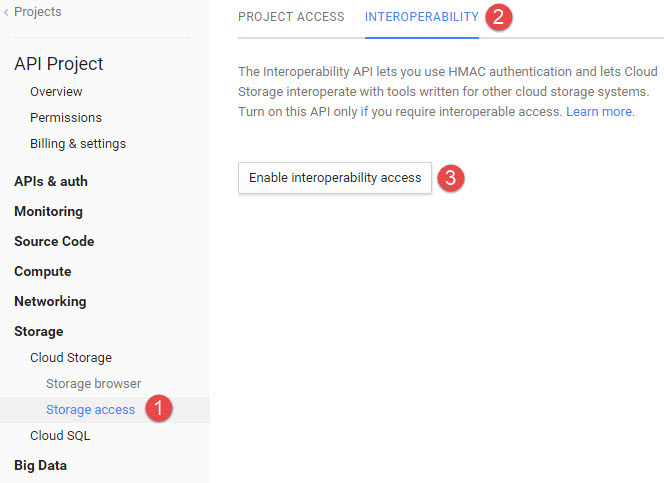 Instead during the Cloud Sync setup flow I was taken to the standard Google OAUTH2 webpage dialog to grant permission for the Synology to get access to me Google account. The problem I’m having now is that I can sync one folder (one “task” in the cloud sync app) but it won’t sync a second. Does anyone know why or how to fix that? has anyone been able to use this using the Synology Bacup&Restore app? David Conway, Were you able to find a way to sync all shared folders on the NAS? I have the same issue, I can only create 1 task which allows me to sync only 1 folder. – Launch this tool and give it your encrypted files and your password (or your key provided by your NAS when activating encryption in Cloud Sync).